This from @JimMFelton on Twitter. 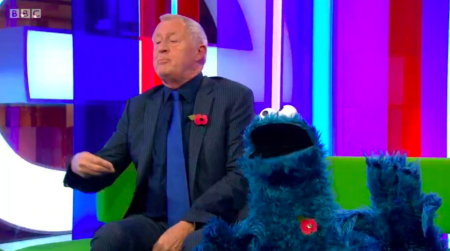 We’ll be wearing a poppy and imagine you will be too, but is it necessary for the Cookie Monster to wear one? Maybe Cookie Monster wanted to, right? It provoked a lively debate on Twitter. Interested in your thoughts too. It’s going through his skin – way more dedicated than most. Dolce et Decorum est, pro patria cookie. I LOVE faux-intellectuals sneering at the act of paying respects to the dead, I just love it! It’s so fresh! He must be edgy, he’s got a We Go Live To Brexit pinned tweet. I just shot coffee through my nose in a public place laughing at this. 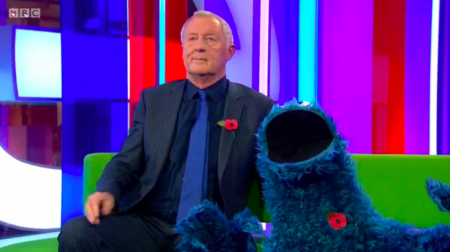 This is what happens when people appearing on telly this week without poppies are given the pitchfork treatment. We reckon John Simpson says it best. Just bought my poppy. I'm proud to wear it but hate the idea it's some kind of patriotism test. It's just a good way of helping ex-soldiers.